Letter No. 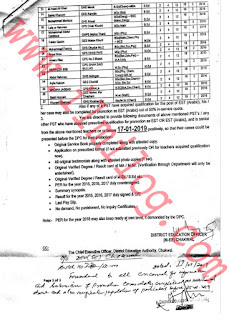 109/EC-I dated 16-01-2019 regarding PSTs Promotion with Higher Primary School Teacher Qualification by Office of the District Education Officer (M-EE), Chakwal. 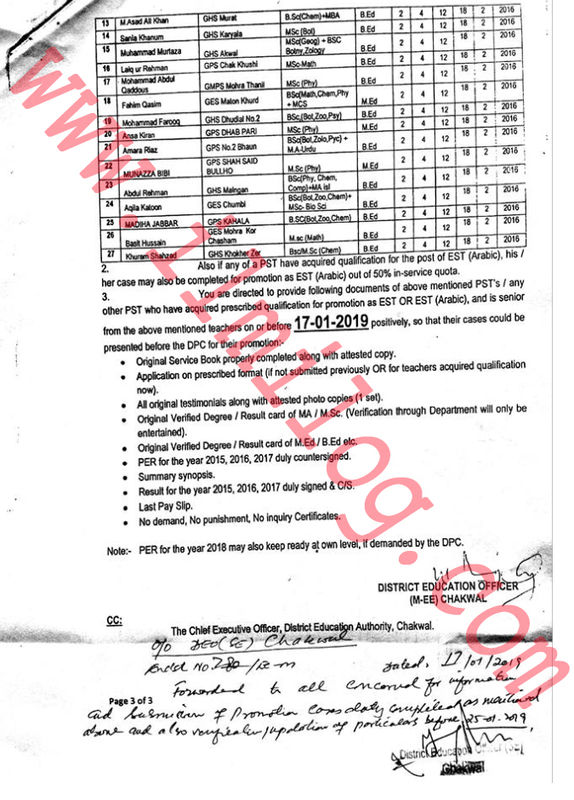 The District Education Officer (SE), Chakwal. 2- The Deputy District Education Officer (M-EE), Tehsil Chakwal. 3- The Deputy District Education Officer (M-EE), Tehsil Talagang. 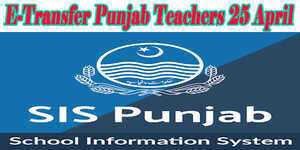 4- The Deputy District Education Officer (WEE), Tehsil Kallar Kahar. 5- The Deputy District Education Officer (M-EE), Tehsil Choa Saiden Shah. 6- The Deputy District Education Officer (M-EE), Tehsil Lawa. Subject: IDENTIFICATION OF PSTs FOR IN-SERVICE PROMOTION. 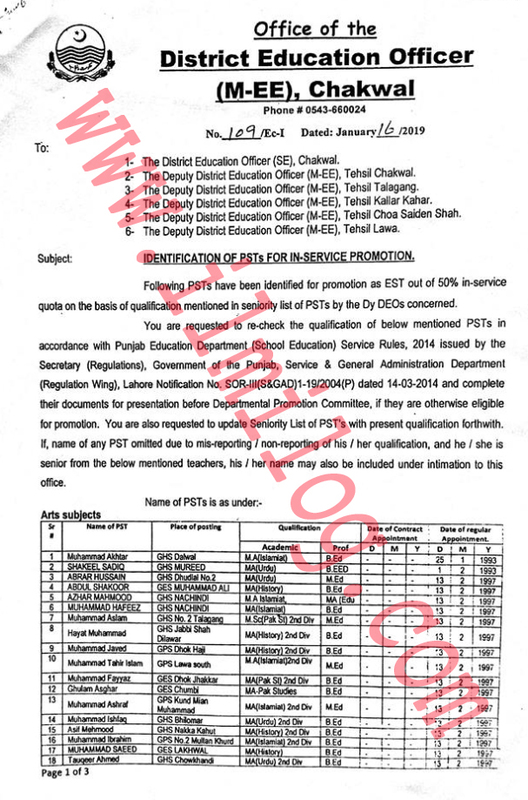 Following PSTs have been identified for promotion as EST out of 50% in-service quota on the basis of qualification mentioned in the seniority list of PSTs by the Dy DEOs concerned. 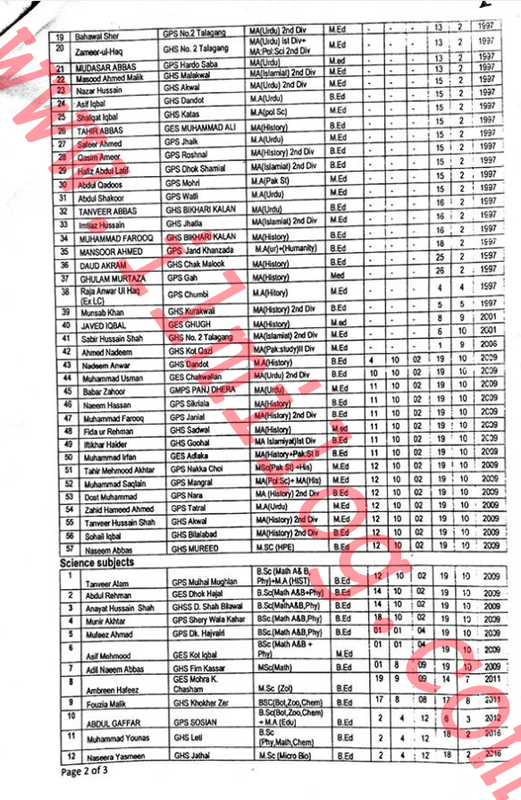 You are requested to re-check the qualification of below mentioned PSTs in accordance with Punjab Education Department (School Education) Service Rules, 2014 issued by the Secretary (Regulations), Government or the Punjab, Service & General Administration Department (Regulation Wing), Lahore Notification No. SOR-III (S8GAD) 1-19/2004(P) dated 14.03-2014 and complete their documents for presentation before Departmental Promo. A committee, if they are otherwise eligible for promotion. 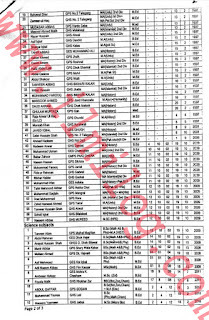 You are also requested to update Seniority List of PST's with present qualification forthwith. 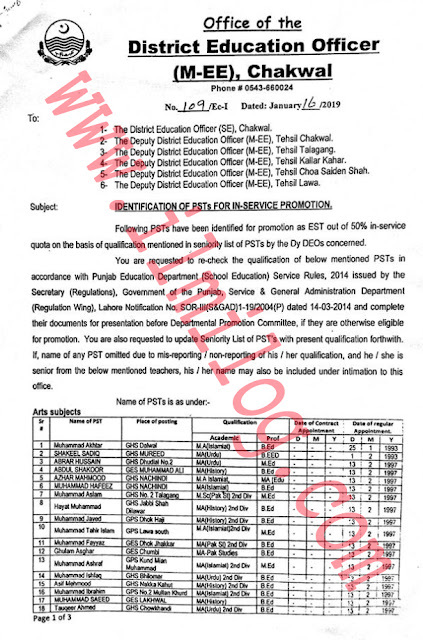 If a name of any PST omitted due to miss-reporting / non-reporting of his / her qualification and he/she is senior from the below mentioned teachers, his / her name may also be included under intimation to this office.